Captivating. 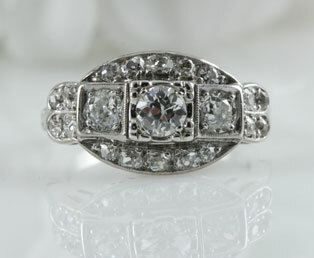 Rich beauty is created from the light dispersed from old cut diamonds in this antique diamond platinum dinner ring. Three high quality old cut diamonds (VS2- SI1, G - H) are horizontally mounted at the center of this diamond platinum dinner ring. These old diamonds are beautifully framed in simple, individual square frames in this heirloom ring. Eight fabulous old-mine cut diamonds, framed in a split loop design are found at the corners of this ring. Two semi-circles of matching, bright old mine cut diamonds frame the top and bottom of this luxurious cocktail ring. An 18kt white arthritis ring shank is a recent addition to this ring, allowing for this ring to be worn with enlarged knuckles. This top of this ring is platinum. Old mine cut diamonds were generally hand cut diamonds, they are recognized by their square girdle and high crown. For the most part, they ceased being cut around 1900 as new diamond cutting tools were developed. The prevalent diamond cut was the old European cut diamond, recognized by a rounded girdle and a more symmetric diamond cut. Old European cut diamonds were cut from approximately 1900 to 1920.